Dr. Graboys was a senior physician at the Brigham and Women’s Hospital and a professor of medicine at Harvard Medical School. He was a devoted teacher and a loving husband, father, grandfather and friend. A fellow under the tutelage of Dr. Bernard Lown, Dr. Graboys rose quickly to prominence in his field, practicing medicine as an art of healing and compassion. He was a leader of the Greater Boston Physicians for Social Responsibility, and along with Dr. Lown, he was among the team of physicians who became recipients of the Nobel Peace Prize in 1985 for their work with the International Physicians for the Prevention of Nuclear War. Words that rang true to him have been long associated with Dr. Lown: Do as much as possible for the patient and as little as possible to the patient. For that reason, to his colleagues he was known as a physician who chose low-intervention approaches to cardiac care, opting instead to spend more time with them at bedside or in clinic. Dr. Graboys was an athlete who ran marathons, piloted glider planes, and yes—with a mindset of leaving no mountain unclimbed—took spin classes. His joie de vivre had no limits; few knew he was a drummer in an all-cardiologist rock band, the Dysrhythmics. His remarkable book about his own struggle with Parkinson’s, Life in the Balance, continued his lifelong commitment to teaching and healing patients—even as he became one himself. Dr. Graboys was an exceptional, kind and generous man, loved by all. Our deepest condolences are extended to his family and friends. Tom was student, cardiac fellow, colleague, associate, intimate friend, activist in the struggle for medicine with a human face and ultimately he was my teacher. His illness was tragic on many scores, especially his being held hostage in a failing body, while forced to witness intimately and painfully the onrushing dissolution. His book “Life in the Balance,” written with Peter Zheutlin, with insightful editing by Vicky, is a classic. It inspires courage, teaching that dignity does not have to be sacrificed when body and brain disintegrate. When I visited Tom two weeks before his death, he was very restless and told me that the worst burden is the feeling of enormous guilt for ruining Vicky’s life and tormenting his family. He repeated the word ‘guilt’ several times. Medicine was in Tom’s genome, the art of healing in his soul. 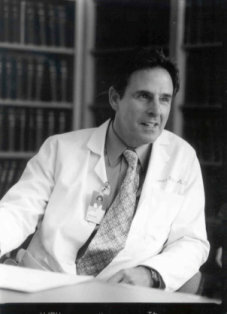 Dr. David Greer, a general practitioner in Fall River, later Dean of Medicine at Brown, told me that he made a house call when Tom was sick with severe pharyngitis. Tom was at the time about 12 years old. Though Tom had a high fever and could barely talk, he asked Dr. Greer whether he could round with him at Truesdale Hospital, which he thereafter did. From childhood on, Tom was determined to be a doctor. While in medical school Tom spend summers working in my laboratory in the Harvard School of Public Health and in my clinic. When in 1975 I offered him a permanent position, now newly married, he had vivacious Caroline inspect me to determine, I guess, whether I was a reputable character, Fortunately for me, I passed muster. When Tom started working in our clinic, to help him build a practice, I referred patients to him. Some resisted going to a new physician. I promised that the following visit I would see them. Sad to say not a single patient sought my counsel thereafter, though they were ever grateful for the referral. Patients treasured him, able to seek his counsel day or night. Never rebuffed, always welcomed with a ready smile. He was their confidant and friend. Tom’s optimistic demeanor, as well as readiness to spend endless time, endeared him to patients and families alike. During a consultation he sat just opposite the patient not separated by a desk. Patients felt as though they had all the time in the world. Tom knew more about many of them than their own families. He realized that the art of medicine was far more difficult to muster than the science. I maintained that Tom was a jewel in the crown of medicine. His death creates an immense void for all those who knew him, especially his family, patients and friends. Facile words are inadequate to overcome the emptiness. While Tom liberated from Jobbian agonies, the tragedy is largely for those of us who remain behind. NEW! Life in the Balance: A Physician’s Memoir of Life, Love, and Loss with Parkinson’s Disease and Dementia, is now availabe for purchase through the Barnes & Noble NOOK. For more information or to purchase a NOOK book copy, please visit the Barnes & Noble website. Dr. Graboys was recently interviewed by Dr. Peter Rabins for the spring 2011 issue of the Johns Hopkins Bulletins: Memory Disorders. Read the interview here. Dr. Graboys contributed a chapter on cardiac arrhythmias to a recently published book titled Integrative Cardiology (eds. S Devries & J Dalen).